Landscape contractors are no longer riding out the storm. 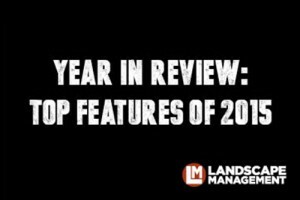 Finally doing well, most companies looked for ways to get ahead in 2015, and reading LM’s feature stories was a great way to find tips, tricks and advice. After all, LM is your guide to growth. “The 2015 LM150 list” by LM Staff (June 2015)—Our yearly list of the industry’s 150 largest firms was the most read feature story of 2015. The Brickman Group/ValleyCrest Landscape Cos. topped the list with $2 billion in 2014 revenue, and the top five also included the recently merged TruGreen at No. 2 and Scotts LawnService at No. 4. In addition to the list, check out an analysis of its data, the top 25 leaders in client mix and profit centers and the 74 companies that grew 10 percent or more from 2013. “13 big ideas” by LM Staff (June 2013)—In 2013, 13 companies on the LM150 list let us in on simple suggestions, like using mobile technology and increasing in-person client communication, and unconventional advice, like moving to a four-day work week, rebranding and hosting client education sessions. It’s still a popular read, and the information is as applicable now as it was in 2013. “Simple and stupid overhead recovery” by Sarah Pfledderer (August 2014)—Find out how three companies recover overhead in their labor rates by implementing a simple, three-pronged formula. “The last proposal you’ll ever have to write” by Jody Shilan (November 2013)—Design expert Shilan explains how using a template makes the proposal-writing process less tedious. Be sure to download and personalize Shilan’s sample template to simplify your proposal-writing process. “Cracking the code” by Sarah Pfledderer (November 2014)—Searching for software is difficult. Buying the right one is even tougher. YardBook, cloud-based, ArborGold and QuickBooks start sounding like a foreign language. This piece by Pfledderer provides clarity, as landscape contractors share their favorite systems and implementation strategies to make the process a little bit easier. “The Amazon effect on segmenting consumers” by Shaun Kanary (June 2014)—Weed Pro’s director of marketing discusses how landscape companies can use Amazon’s segmented marketing strategy as a model for their own marketing approaches, and he touts the technology that’ll help them do it. “Paying by piecework” by Dave Tucker (July 2013)—Whether you’re considering a move to a piecework pay system or just trying to figure out exactly what that means, this 2013 article adapted from Dave Tucker’s book, “Lawn Maintenance and the Beautiful Business,” is a great starting point. Then read Tucker’s 2015 follow-up to figure out how to implement the system of paying employees for the time it takes to do the job. “Step by Step: How to prune young trees” by LM Staff (February 2015)—Proper care during the first two to three years of a tree’s life is vital to its health and appearance. Follow these steps to proper pruning, ensuring your tree turns out beautiful and low maintenance. “A shot of salt” by Sarah Pfledderer (August 2014)—Salt brine can prevent a bond from forming between falling snow or ice and an outdoor surface. Find out how to add salt brine to be proactive and reactive in your snow management approach. Be sure to check out our other Year in Review content, including our Editors’ Picks and the Top Headlines of 2015 (to come next week).